The core of the story is definitely true. 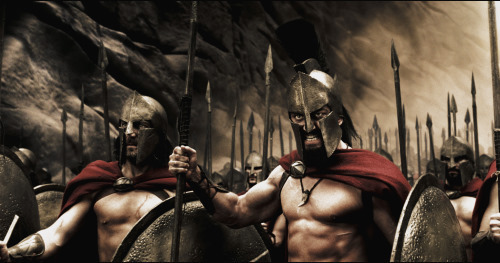 Around the year 480 BC, the Persian army led by Xerxes invaded Greece. 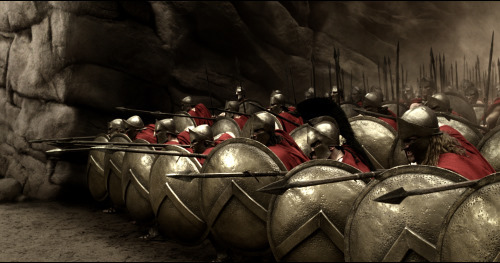 At the pass of Thermopylae ("The Hot Gates"), the Greek army stopped the invaders for three days before being betrayed, which allowed the Persians to break their resistance. 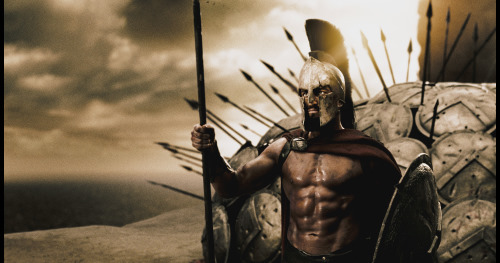 Dismissing the rest of the army, king Leonidas of Sparta with 300 Spartan and 700 Thespian soldiers secured the retreat of the Greek army, knowing very well that their mission was suicidal. The size of the Persian army was evaluated between a few hundred thousands (by the modern historians and military experts) and 2 millions (by the ancient historians such as Herodotus). By intelligent military strategy and use of the terrain, and also due to extreme courage and martial skill, a handful of people stood against an enemy which outnumbered them 100:1. 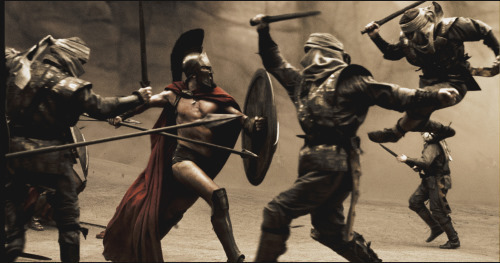 The resistance put up by the Spartans at Thermopylae allowed Greece to reorganize their military and eventually defeat the huge Persian army after two decisive battles at Salamis and Plataea. Much like his father Darius, who was defeated at Marathon 10 years before, Xerxes lost the war and was forced to retreat - that put an end to the long Greco-Persian War and stopped forever the Persian expansion into Europe. So that is the history. The graphic novel and the movie build upon it a tale which, while at the core staying fairly close to the historic truth, in its substance is highly symbolic. One cannot escape the impression that the movie is like a violent dream. Reality is changed and certain things are transformed, amplified, reduced or simply made up, just like in the dream-consciousness. This is not pure fact like in the history books, it's more like subconscious imagery, more like the conversation of the deep, primitive, emotional brain with itself. Without doubt, that is Frank Miller's contribution. His graphic novels possess exactly this dream-like quality, which is relayed without loss, perhaps even amplified, by the movie. The defenders are very much the morally flawless "straight arrow" (pun intended) types. Their courage in battle and indifference to mortal danger is superhuman and is paralleled only by their feats of extraordinary strength and martial skill. Taken literally, these characters are not humans, but archetypes. And so are the invaders - archetypes, but of the opposite kind. Arriving in huge numbers, more like waves of insects or some kind of plague than human beings, looking alien, ugly, deformed, or sometimes, like the emperor Xerxes, majestic and beautiful yet somehow irretrievably flawed and corrupt spiritually, the Persians are made in such a way that the spectator cannot identify with them. They're de-humanized, a deadly danger for the core values of the human species. Around the time of the Greco-Persian War, the Greek cities were in the middle of what we could call the Greek Renaissance. This was the time when the Greek mathematicians such as Thales came up with the very concept of space and created the foundations of mathematics, the science at the core of all other sciences. This was the time when the first philosophers such as Socrates created the fundamental rules of human thought and reason. This was the time when the Greek cities went through humanity's first experiment with the concept of democracy. These were the forerunners of Reason, the people who invented the very principles upon which the European Renaissance, two thousand years later, made its unprecedented expansion. And it was because of the Renaissance that Reason became a major social force in the West. And it was Reason that allowed Science to take off on its own. It was Reason that propelled the industrial revolution. It was Reason, working at the core of the social fabric, that made possible for the Western countries to build upon the Greek's timid beginnings and create Democracy, true and large-scale for the first time on this planet. If we're living today in democratic societies, decipher the secrets of Nature, and fly rockets to the Moon, Mars and beyond, it is because we're building upon the foundations laid by the brief but spectacular progress made by the Greek cities more than two thousand years ago. That was the light that was threatened by the Persian invasion. Sure, the Persians in reality were not the evil and decayed barbarians, like one may deduce from a literal interpretation of the movie. Their society was quite advanced by the standards of their time. But what the Greeks possessed while the Persians lacked was this impulse to experiment, to make progress, to evolve. The Persian rulers at the time (the Achaemenid dynasty) were "enlightened despots" - enlightened but far from the novel concept of democracy which was just being worked out by the Greeks. While the Persians were clearly not ignorant and were quite familiar with the science and technology available at the time, it was the Greeks who allowed themselves to pursue science for the sake of science, to forge the principles of philosophy with no immediate practical reward, and to cast off the tried and true structure of centralized political power and gamble on this new strange idea that free men can gather and vote and decide together their destiny. It could be argued, therefore, that the modern world was made possible because the Greeks won the Greco-Persian War. And that war was ended at Salamis and Plataea. And the result of those battles was enabled by the delay suffered by the Persian army at Thermopylae. 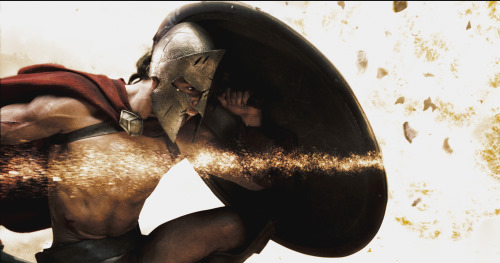 Quite literally, Thermopylae was the battle that changed the world. So that is why the movie uses this metaphor, presenting the Persians as some kind of sub-human freaks. The meaning, from the perspective offered by history, is pretty clear. At Thermopylae, Light, i.e. Reason, was being threatened by Darkness. And the makers of this movie are quite aware of this interpretation and there's proof that they used it consciously and on purpose - just pay attention to Queen Gorgo's speech at the Spartan Council. The word "reason" is used quite deliberately by the authors of the screenplay. There are also some less fortunate possible interpretations of the movie. One of them is based on the fact that the defenders are very clearly Caucasian, while the invaders are some kind of mixture of Asian and black types. This is very likely a false issue since, after all, the movie has some historical truth at the core - that the Greek army (European people) fought the Persians, who came from Asia. The other uncomfortable connection is that Persia is what we call nowadays Iran. It's probably just an ironical coincidence that today there's a lot of tension between Iran and the United States. I would expect to see some comments connecting the movie to the current political situation, but it's likely that most will be blown out of proportion - I'm not looking forward to that. Visually, the movie is beautiful. It is obviously made in the post-Matrix era and squeezes out of this heritage as much as possible. A very large percentage of the movie (pretty much all battle scenes) is filmed in slow-motion. The characters move, run, jump and fly through the air with some kind of eerie, masculine and martial grace. Like I said, the movie draws heavily upon its Matrix heritage and, through that, upon the Asian martial arts movies. But there's a difference. What in the classic martial arts movies is pretty much just a bunch of useless tricks and flourishes, it simply does not exist here. What "The Matrix" started, moving away from the classic Asian movies, towards a heavier, darker, more "substantial" style, the movie "300" takes to the ultimate consequence. The fighting here is very heavy, very much based on strength, both physical and moral. Very bloody too. The bunch of "martial" gimmicks are gone. This movie uses the fighting scenes to convey the idea of unwavering decision and strength of character - and succeeds very well. The Spartans mowing down their path through the Persian troops possess a sort of virile and violent majesty and beauty, like some kind of gods of war descended upon Earth. One more thing. Those engaged in extreme sports are familiar with this feeling - and I can only assume it's similar with people on the battlefield, only much more powerful probably. When facing extreme physical danger, one can react in two ways - back off and give in to fear, or push forward. If the latter path is chosen, the resistance is conquered, and there's a sense of victory more of the inner kind - then there's no fear, it is replaced by a sort of intense and harsh joy, like a sun burning and scorching while it illuminates. This is such a common experience among people who pushed their physical limits, yet it's so rarely depicted in movies. I believe I've seen it for the first time (or, at any rate, shown so clearly and at such high degree) only now, in the movie "300". Bungee jumpers, motorcycle racers and skydivers know exactly what I'm talking about. Even more so, I guess, people who actually went into battle. It's the kind of joy/rage that you just cheated Death, or at least catastrophe, and defeated and humiliated the ultimate enemy, Fear. 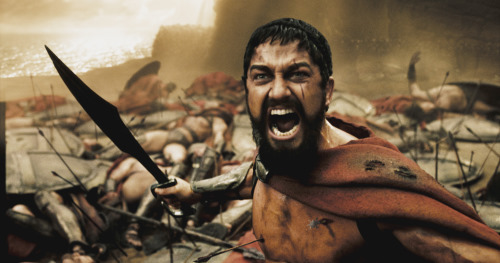 Gerard Butler is absolutely awesome in the role of Leonidas. His is the character of the warrior-king, the solar type - strong, brave, and noble. He absolutely drives the whole plot and polarizes the scenes with his intensity and presence. The make-up builds the classic Greek appearance, curly hair and short beard, like a marble statue alive and breathing. Lena Headey creates queen Gorgo, the polar opposite, but on the same register of moral strength and dignity - she's the beautiful woman, very feminine and physically delicate (opposed to Leonidas' rough masculinity), and also the caring mother of a young boy, and also the queen, the king's wife and his first and most wise counselor. Yet, for all her apparent fragility, Gorgo is very capable of drawing a sword - after all, she is not some kind of a spoiled princess, but the queen of Sparta. The Spartan upbringing of the character creates quite an interesting tension with the fine and graceful features of the actress - which makes her even more worth watching, beyond just her obvious beauty. Rodrigo Santoro plays Xerxes and gives this character some sort of smooth and creepy majesty - there's something wrong with him, yet you can't quite point out the reason. The images are overprocessed and moody, giving this movie the air of a graphic novel that came alive - which is exactly what it is, after all. The colors are unnatural - again, the Matrix heritage, combined with Frank Miller's trademark design - and reflect the dark and violent action that takes place in the forefront. The raw weaponry reminds the viewer of the Lord Of The Rings movie trilogy - the swords as shown in the movie are not accurate representations of the actual weapons used by the Spartans and Persians, but again this belongs to the realm of dream imagery, and at least they're convincing enough. Blood is splattered all over the screen, and this too is not shown in a realistic fashion, but instead chooses to stay faithful to Miller's graphic novel. Someone said that in "300" the drops of blood fly more like rose petals blown away by a storm - a pretty accurate comparison. So, that's it. A classic tale of Good versus Evil, Light versus Darkness, of transcending the human condition through extreme courage. It can be watched on many different levels. Frank Miller's fans will be delighted by the faithful representation of the graphic novel. Those who appreciate action movies will be more than satisfied by the spectacular battle scenes. People looking for an intellectual challenge will enjoy deciphering the symbols woven into the plot and images. And history buffs too will get something out of it, provided that they accept the fact that the movie is a metaphor, not realistic depiction. Two thumbs up and I'm really looking forward to buy the DVD edition when it comes out.